Poor inhaler technique and inferior asthma outcomes are evident in older adults. Reviews comparing metered dose inhaler (MDI) and dry powder inhaler (DPI) techniques across older adults and younger cohorts are scarce. This systematic review aimed to determine whether differences exist between such cohorts with regards to the number and type of MDI and DPI errors made. A systematic literature search was conducted in Embase, Medline and PubMed from July 1 to December 31, 2016. Studies were selected in accordance with preset inclusion criteria, relevant data were extracted, and quality was assessed with validated checklists. 14 studies were identified. Evidence suggests a negative correlation between advancing age and correct technique across MDI and varying DPI devices when examined collectively. Differences appear to exist between older adult and younger cohorts prescribed MDIs in error types. There is evidence of age-associated differences in the number and type of inhaler technique errors. Further research is required to assess outcomes in individual DPIs, reproducibility and the effects of confounders. Proficiency in inhaler technique is critical to the attainment of optimal asthma outcomes. Globally, the centrality of inhaler technique maintenance in asthma management is heavily emphasised by numerous respiratory authorities, and referred to more than 50 times in key asthma management documents . However, although healthcare professional-coordinated inhaler technique training can improve asthma control [2, 3], inhaler technique remains a significant problem. From the currently available data, across all ages, as many as 90% of patients are estimated to demonstrate incorrect technique , contributing to increased hospitalisations  and forfeiture of billions of dollars in pharmaceutical expenditure . An otherwise vulnerable population, the elderly, are particularly at risk, on account of increased evidence of cognitive and physical disorders affecting their ability to emulate and retain required skills [7, 8]. The need to address any needs of the elderly is a global trend and there is recognition that, with asthma mortalities and management costs being greater in the elderly, it is essential that the ability of guidelines to optimise their technique be urgently reassessed and any issues rectified . Addressing the concern that costs will continue to surge due to ageing of the population, the European Innovation Partnership on Active and Healthy Ageing has advised the implementation of evidence-based innovative healthcare services to enhance healthcare-system outcomes and efficiency . Globally, geriatric-specific education programmes in other chronic disease states, such as arthritis, have elevated outcomes, lending support for their application in practice . However, their application in respiratory management has been underdeveloped and, consequently, inhaler technique education guidelines remain generic, failing to specifically address the way in which training can be delivered effectively and within an age-individualised approach. The development of age-appropriate inhaler technique training able to overcome the unique challenges to skill acquisition in the elderly, including increased rates of cognitive impairment, is an important strategy to enhance healthcare outcomes for the elderly. To develop education better addressing geriatric needs, we first need to review the evidence behind the differences between the elderly and the general population in terms of their current inhaler use, and their ability to achieve and retain mastery of technique. Reviews have explored factors predisposing elderly patients to inferior technique [12–14], but a comparison of the number and types of errors made with different inhalers across a range of adult ages has not been performed. This is critical in order to determine the specific areas to address in the formulation of age-appropriate training. This review therefore aims to determine whether there is evidence to support the hypothesis that a difference exists in the 1) frequency and 2) nature of inhaler technique errors made by older adults and younger patients. An electronic search of the literature was performed between July 1 and December 31, 2016, until data reached saturation. Searches were conducted in Embase via OvidSP, Medline via OvidSP, and PubMed. The full search, including search strategy queries, is presented in supplementary table S1. Titles were independently screened to include relevant articles. Included studies consisted of original research in English comparing at least one of the following: differences in numbers or types of errors with age across older adults and younger patient cohorts with asthma and/or chronic obstructive pulmonary disease (COPD). Interventions were required to include assessment of inhaler technique through observation of unaided or investigator-trained practice. Publication date filters were not applied. Articles were excluded if the full publication was unavailable. A systematic review was undertaken in compliance with the methodological and reporting standards recommended by the Preferred Reporting Items for Systematic Reviews and Meta-Analyses (PRISMA) statement . Articles were assessed for relevance according to the PRISMA flow diagram for data inclusion, as presented in figure 1, and reviewed by examination of titles and abstracts. Duplicate studies and articles not satisfying the inclusion criteria were omitted via EndNote X7. Articles were augmented by publications otherwise known to the authors. Flow diagram of studies included in the systematic review. Data extraction occurred independently according to the University of Wisconsin Health Sciences Data Extraction protocol . Data included reference details, including author, year and citation; eligibility criteria, including sample characteristics and outcomes measured; method of inhaler technique assessment and interventions; and main outcomes results. Variables for which data were sought included outcomes as above. The results were investigated, quality-assessed and compared to others exploring the same outcomes. The principal summary measure was variation in mean outcomes with age. Due to the marked diversity in the thresholds applied in the definition of older adulthood, the heterogeneity in the scoring systems and methodologies used, the methods of results presentation, lack of disclosure of potential moderators, and the limited number of studies available for certain outcomes, further meta-analyses and statistical analyses, including sensitivity/subgroup analyses and meta-regression, were not performed. To assess quality and the risk of bias, the National Heart, Lung and Blood Quality Assessment Tool for Observational Cohort and Cross-Sectional Studies  and the Effective Public Health Practice Project Quality Assessment Tool for Quantitative Research for interventional studies  were used to assist in selecting investigations of low risk of bias. Factors potentially affecting the results, including assessment technique, interventions, sample size and potential confounders, such as medical and socioeconomic profile, were considered. Critical appraisal and risk of selection, performance, detection, attrition and reporting bias within and across studies on account of methodology, lack of participant or investigator blinding, and potential funding were assessed independently by two reviewers, and papers were included if deemed by both to be of sufficient quality and objectivity. The search identified 787 investigations, composed of 438 results from Embase via OvidSP, 217 from Medline via OvidSP and 132 from PubMed. Three additional records were sourced through investigations known to the authors. Following duplicate removal, 597 records were retained. After screening by title, abstract and eligibility criteria, 47 articles remained. Full texts were read, and 32 articles excluded, with 25 excluded due to lack of satisfaction regarding the age requirements, 22 due to lack of examination of age as an independent variable, and others due to both (supplementary table S2). A total of 14 studies satisfied the final inclusion criteria and were included in the final qualitative synthesis of the outcomes of the systematic review (figure 1). Studies differed according to methodology, with 10 employing an observational, cross-sectional methodology [4, 5, 7, 19–25], one an observational, comparative, cohort methodology spanning 18 months , one a comparative, cross-sectional methodology employing a community intervention , one a comparative, cohort study employing a community intervention spanning 4 weeks , and one employing a randomised-controlled-trial cohort design spanning 6–10 weeks (supplementary table S2) . The included studies were published between 1979  and 2015 , with samples ranging from 59  to 3995  participants, and ages ranging from 6.1 years  to older adulthood. 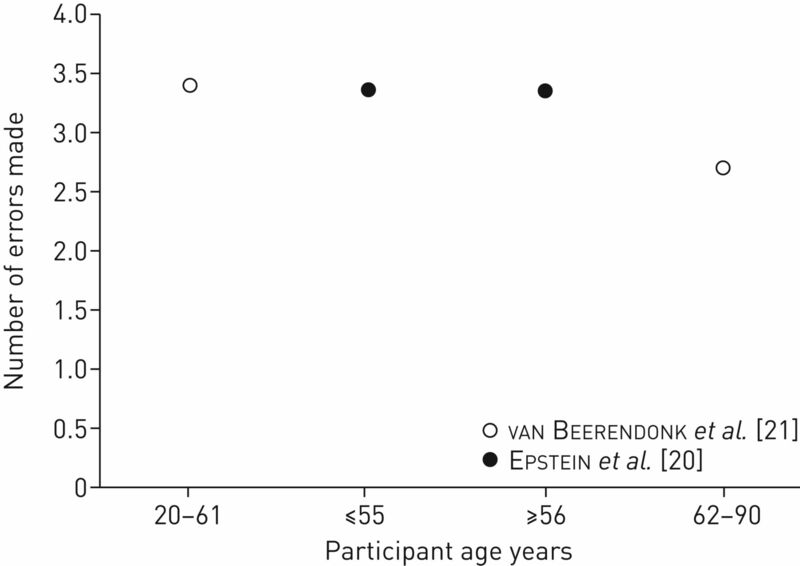 Age thresholds for older adults varied between investigations. The study populations, including the number of patients recruited in each age demographic, and outcomes are reported in supplementary table S2. Investigation of the literature identified outcomes that will be discussed in the following sections of this article. 14 studies examined the impact of age upon the frequency of inhaler technique errors presented as a main outcome. Of these, six explored the impact of age on inhaler technique in general (combining the use of all inhalers, including the metered dose inhaler (MDI) technique), five examined varying dry powder inhaler (DPI) and MDI devices [5, 21–24], and three examined the impact on specific device inhaler technique (four DPIs and an MDI) [19, 25, 28]. Graphical representations of the results for which sufficient data were available for studies exploring age categorically are presented in figures 2 and 3. Graphical representation of percentage of participants performing inhaler technique errors according to age. Graphical representation of number of inhaler technique errors made (standardised to a score out of a maximum of 10 errors). Examinations yielded mixed outcomes. Six studies were observational, with five applying a cross-sectional approach [4, 7, 19–21] and one applying a cohort approach, reassessing participants over 18 months . One employed a community training intervention prior to assessment, examining patients at that point in time , and one employed a cohort randomised controlled trial approach, randomising patients into two separate training interventions and assessing patients at baseline and 6–10 weeks afterwards . The final study applied a comparative cohort approach utilising a community training intervention, assessing patients at baseline and 4 weeks afterwards . Inhaler technique was assessed by trained assessors or healthcare professionals, including respiratory technicians [20, 26] and general practitioners (GPs) [4, 19]. Error frequencies were compared on the basis of age using standardised assessment procedures and investigator-developed inhaler technique checklists. Of the eight studies, five identified a positive association between age and MDI technique [4, 19, 26–28], with statistical significance reported in three [4, 26, 27]. In three studies, variations in technique with age were identified in cohorts in which age was expressed categorically. Armitage and Williams  divided 326 patients into groups aged <65 years (n=225) and ≥65 years (n=101) for training and assessment over 18 months according to standardised procedures. Statistical analysis determined that only 29% of older adults, as opposed to 45% of younger patients, were able to demonstrate correct technique (p<0.01, 95% CI 5–28%). Giraud and Roche  examined the frequencies of MDI technique errors in patients who had been prescribed regular inhaled corticosteroids for at least 3 months, as per GP assessment, identifying a significant increase in misuse with age. Error frequencies ranged from 61% to 70%, 77% and 86% in patients aged 15–30 years, 30–60 years, 60–75 years and >75 years, respectively (p<0.00001). Molimard et al. compared the frequency of critical MDI technique errors by device, in a cohort of 552 patients divided into three categories (aged ≤30 years, 31–64 years and ≥65 years). Critical errors increased with age, with frequencies of 22%, 24% and 40% in patients aged ≤30 years, 31–64 years and ≥65 years, respectively. Dahl et al. employed a 12-point inhaler technique checklist in a cohort of 151 patients, identifying an increase in the percentage of patients demonstrating errors from 50% to 55% and 63% in patients aged 43–65 years, 66–71 years and 72–85 years, respectively; however, statistical significance was unreported. Positive associations between advancing age (presented as a continuous variable) and MDI misuse were further identified by Horsley and Bailie , who assessed MDI technique in 86 patients aged 17–83 years with reference to a set checklist for inhaler technique prior to community instruction (p=0.019). Three studies did not identify positive associations between age and error frequency [7, 20, 29]. Epstein et al. 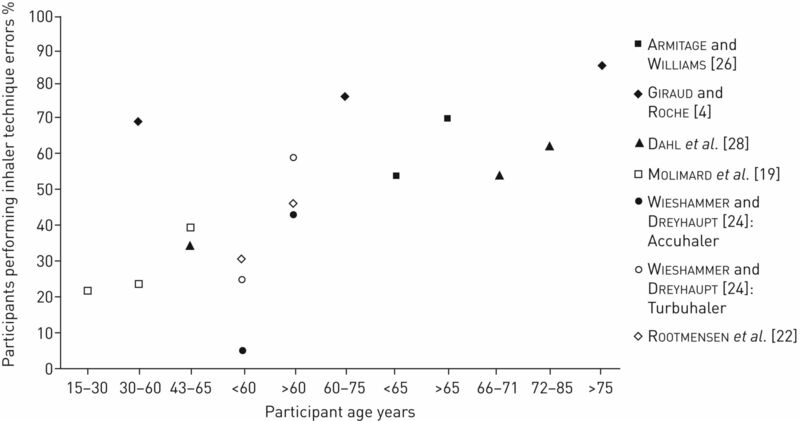 performed a single-blinded observational investigation to assess MDI technique in 130 patients aged 18–83 years, identifying that age was not significantly predictive of inferior technique when a cut-off of 56 years was chosen to describe age as a dichotomous variable. Specifically, the mean number of errors made by people <56 and ≥56 years of age was 7.3±2.8 and 7.3±2.4 errors, respectively (p=0.94). De Blaquiere et al. compared 100 correct and incorrect MDI users, identifying that the mean age of incorrect users of 60.3±10.9 years was lower than that of correct users, at 63.0±8.7 years; however, this was not statistically significant. Goodman et al. explored inhaler technique in subjects aged <25 years, 25–39 years, 40–54 years and ≥55 years, using an MDI adapter and microcomputer to assess inhaler technique. An association between age and inhaler technique failed to be identified. Sadowski et al. assessed MDI technique via observation in 161 patients with asthma or COPD with a mean age of 56.9±18.59 years according to checklists founded upon national respiratory authorities. Nonsignificant negative correlations of −0.136 and −0.070 were found between age and inhaler technique scores for the MDI and MDI with a spacer, thus indicating a lack of significant association between age and proficiency in technique. Eight studies explored the impact of age on proficiency in inhaler technique across a range of DPI devices [5, 19, 21–25, 28]. Seven employed a cross-sectional, observational methodology [5, 19, 21–25], and one a cohort community intervention conducted over 4 weeks . A range of DPI devices were analysed collectively in four studies [5, 21–23], and individually in three investigations [19, 25, 28]. Inhaler technique was assessed by investigators [5, 22, 23, 28], research assistants , a trained pulmonary technician, or either a GP  or GP assistant  via reference to standardised investigator-formulated or national  inhaler technique checklists employing direct observation or triplicate referral of a video-recording of technique. A positive association between error frequency and age was identified in six studies, with statistical significance identified in five, unreported in one, and unidentified in the latter study . Positive associations were identified in examinations exploring age both categorically and continuously. van Beerendonk et al. explored age categorically in 316 patients aged 20–90 years who were prescribed a Diskhaler, Rotahaler, Ingelheim inhaler (HandiHaler) or MDI. A comparison was undertaken of the number and nature of errors made between age cohorts. Analyses with ANOVA and t-tests revealed a statistically significant elevation in the mean number of errors in patients aged 62–90 years relative to those aged 20–61 years (2.73 versus 2.16 errors, t(314)= −3.15, p<0.01). Rootmensen et al. further performed univariate analysis of a number of potential predictors of inhaler technique in 156 patients prescribed a Turbuhaler, Aerolizer and pressurised MDI (pMDI). A statistically significant difference in error frequency was identified with age, with 47% of patients ≥60 years demonstrating errors, as opposed to 31% of patients aged 18–60 years (p=0.05). Dahl et al. identified similar associations with the HandiHaler, identifying proficiency in approximately 65%, 50% and 45% of patients aged 45–65 years, 66–71 years and 72–85 years. Molimard et al. explored the relationship between age and the Diskus and Turbuhaler, similarly identifying increasing trends. The authors found the percentages of patients with errors were 6%, 25% and 10% for the Diskus, and 32%, 25% and 40% for the Turbuhaler for the categories of ≤30 years, 31–64 years and ≥65 years, respectively; however, for both investigations, the level of significance was unreported. Sestini et al. explored the impact of age (as a continuous variable) on inhaler technique and identified a strong negative association between technique proficiency across both pMDI and DPIs and advancing age (n=1305; adjusted regression coefficient 0.09, 95% CI 0.01–0.08; p<0.01). A further two studies identified a significant negative correlation between technique and age (as a continuous variable) in 224 outpatients with a mean age of 55.1±20 years prescribed a Diskus, Aerolizer, HandiHaler or Turbuhaler (p<0.01)  and in 1664 patients of mean age 62 years prescribed an MDI, Aerolizer, Diskus, HandiHaler or Turbuhaler . Sadowski et al. assessed Diskus, HandiHaler and Turbuhaler technique as discussed for the pMDI above, and identified a nonsignificant negative correlation of −0.248 between age and inhaler technique scores for the Diskus, and nonsignificant positive correlations of 0.205 and 0.182 between age and the HandiHaler and Turbuhaler, respectively. Thus, a significant association between age and proficiency in technique was not identified. Three investigations explored variations in the nature of inhaler technique error with age with regards to the MDI [21, 26, 27]. Armitage and Williams  directly compared the percentages of patients aged <65 years and ≥65 years making seven different types of error, and identified differences in the frequencies with which different errors were made. Older adults were most likely to actuate MDI devices at the end of inspiration and breath-hold for <5 s, and patients <65 years were also most likely to present these errors, although in reverse frequency. Both cohorts were equally next likely to inhale too rapidly and prematurely actuate the device. Older adults were next likely to actuate the device during expiration, then perform multiple actuations, whereas adults <65 years were equally likely to present both errors. Investigation further revealed that the likelihood of one cohort presenting an error differed with the error, with a greater level of statistical difference identified for delayed or failed actuation of the device (p<0.001) than for late activation and rapid inhalation (p<0.01), and inspiration and breath-holding for <5 s (p<0.05) . Horsley and Bailie  identified similar trends with regard to activating MDIs during inhalation (p=0.056) and failing to assemble the MDI correctly (p=0.059) in patients aged 17–83 years; however, these were not statistically significant. No investigations directly comparing the types of DPI errors with age were identified. However, van Beerendonk et al. identified a statistically significant increase in the number of both skills-related errors (those requiring information and training prior to execution, e.g. simultaneous MDI actuation/inhalation) and non-skill errors (those requiring information only, e.g. removal of cap), made by patients aged 62–90 years relative to those aged 20–61 years prescribed a Diskhaler, Rotahaler, Ingelheim inhaler/HandiHaler or MDI device when analysed collectively. This systematic review identified 14 comparative studies addressing the study aims. However, although providing initial insight into potential variations in all outcomes with age, the results of such studies were inconsistent in nature or unsupported by further studies, so further study is required to gain a clearer insight into the influence of age on inhaler technique. With regard to the incidence of incorrect technique there is some evidence that increasing age is associated with increasing proportions of incorrect MDI and DPI users, with the majority identifying a positive correlation or statistically significant difference in means between older adulthood and inaccurate technique. However, the results were conflicting, with statistical significance unreported in two studies [19, 28] and conflicting for the Turbuhaler and Diskhaler [24, 25]. Only one study, restricted to the pMDI, explored variations in the types of errors made between the elderly and the general adult population . Although it identified variations with age, further studies are required to support these results before applying them to the general population, to account for any possible flaws in the study design potentially affecting the accuracy and applicability of their findings. In considering these results, it is difficult to generalise, and several considerations need to be made. One consideration is the external (in particular, ecological) and internal validity of the studies; that is, the extent to which the sampling procedures, methodologies and method of exploring correlations can be applied to the real-world population. Each of these aspects and their implications for the applicability of the findings to the real-world population will be discussed. One consideration involves the inconsistency of cohort categorisation, with different ages being considered “elderly” in different studies. As sociodemographic factors such as employment status may be affected by highly specific age thresholds, this may limit their generalisabilty to the real-world setting. Another consideration is lack of participant characterisation, particularly with regards to their medical and socioeconomic profiles. Some studies reported diagnosis of COPD and educational status , but their potential relationship with inhaler technique as a subset of age was not explored. This is particularly relevant, as conditions such as cognitive impairment disorders and arthritis can have an impact on mental processes and physical ability, thus becoming confounders. Socioeconomic factors such as lower education and health literacy levels, many of which are more evident in older adults, also remained uncharacterised in the majority of studies, potentially affecting patient aptitude and ability to learn, and compromising both the internal and external validity of the studies. In exploring the older population with regard to respiratory illness, it is important to consider the condition and the generalisability of its control on outcomes. The majority of studies recruited asthma patients primarily from medical clinics, so there could be bias resulting from recruitment of a more severe cohort or a subgroup who may have an overlap of more than one respiratory illness, e.g. asthma–COPD overlap. This could further contribute to the contradictory findings of certain studies. Recruitment of newly referred outpatients in the earlier study , as opposed to those attending community facilities , may have falsely elevated error frequencies; however, whether this is the case or whether it would affect the results is inconclusive, limiting the applicability of the results. The ecological validity of the investigations, that is, the extent to which they can be applied to the real-world setting on account of the study methods employed, may further be constrained by the assessment process. Of concern, most of the studies did not assume a real-life approach, with participant blinding being limited to two investigations [20, 28], potentially resulting in falsely elevated performance scores and affecting statistical outcomes. Further investigations involving recruitment of a more randomised sample with a matched control group or examination of confounders, in addition to technology-enhanced devices that could monitor inhaler technique in real life, could assist in improving their applicability to the real world. Another important consideration is the lack of power of some studies. Given the potential heterogeneity and importance of identifying and accounting for confounders, only a limited number of studies were powered to a high enough sample size to determine the true relationship between age and inhaler technique. This could explain the failure to reach statistical significance in some of the studies identifying trends. Of further concern, information pertaining to certain devices and outcomes is scarce. With regard to error frequencies, only one investigation was identified reporting significance with the HandiHaler , and examining the Aerolizer and Autohaler . In addition, there is little knowledge of whether a specific age threshold exists at which technique may decline, or if factors associated with technique maintenance, such as regular referral to take-home resources, are under-utilised in older adults. Similarly, information regarding the impact of age on the nature of errors is also limited, constraining applicability to the broader population. However, investigations performed purely within each age population (for example, in adults aged 18–65 years or ≥65 years of age) for the MDI similarly suggest that variations may exist, supporting Armitage and Williams . Comparisons of these studies suggest that the forms of errors made by patients of varying ages may differ depending on whether they are more reliant on physical or cognitive function. van der Palen et al. identified that failure to exhale prior to inhalation was the most frequently presented error in patients aged 18–65 years, implying that knowledge deficits as opposed to physical functioning may be of greater influence. This contrasted with errors identified in older adults [31–34], in which tasks dependent more on physical abilities, such as failure to breath-hold and lack of inhalation/actuation coordination [31, 33] occurred more frequently. However, due to the lack of heterogeneity between studies with regard to recruitment, methodology and analysis, further study involving direct comparison within a controlled environment is required to assess result reproducibility. In considering these results, it is important to explore the basis on which age may be a factor in poor inhaler technique. This necessitates an exploration of the factors that change with age and how they may interact with device use, in particular physical strength and dexterity, lung function and cognitive function. A primary consideration is that of physical strength and dexterity. Numerous movement disorders, for example, arthritis, are more prevalent in older adults, and may potentially increase the risk of poor inhaler technique. Armitage and Williams  revealed that 36% of older patients could not generate the minimum force required to actuate any MDI, correlating with their ability to activate an MDI . With only 29% able to generate the minimum force required to actuate all MDIs, this implies that hand strength may be a particularly relevant consideration in device selection in older adults. Advanced age may also independently affect lung function and predict the ability to generate the peak inspiratory flow (PIF) rate required for optimal outcomes from certain DPIs, particularly the Turbuhaler, potentially affecting the type of error made [36, 37]. As many as 75% of older adults may be unable to generate the minimum recommended PIF of 30 L·min−1 for a clinical response from the Turbuhaler , potentially leading to an inferior clinical response . This may be difficult to rectify in practice, with changes subsequent to counselling considered too minor to be cost-effective . The effectiveness of training also appears to be superior with the MDI relative to the DPI , demanding a greater consideration of PIF rate in elderly patients prior to device selection. Age-associated reductions in working memory and executive planning, and the increased prevalence of numerous neurocognitive disorders in older adults, may further contribute to discrepancies in the ability to learn and retain correct technique, potentially increasing the likelihood of error performance in older demographics . There is substantial evidence of significant inverse proportionalities between cognitive status and the ability to successfully learn technique [8, 42, 43]. Allen and Prior  identified that only individuals with full cognitive function could be trained successfully in accurate technique. Explicit abbreviated mental test score (AMT), mini-mental test score and EXIT25 score threshold levels have also been identified at which patients can be trained in the use of certain devices [8, 35, 42–44], providing support for such an association. In the case of the AMT, the thresholds increased with the complexity of the device, suggesting that certain devices may be more appropriate for older adults than others, and a potentially increased demand for cognitive screening in elderly patients. Taken together, these findings indicate that there are numerous physical and cognitive issues unique to or more likely to be evident in the elderly population, potentially increasing their risk of inhaler technique misuse. Knowledge of whether they are contributing to statistically significant differences in the number and types of inhaler technique errors made in real-life practice is therefore essential in the development of innovative and necessary inhaler technique training and monitoring sessions. Certain limitations of this review may restrict the applicability of these results to practice. The restriction of articles to those available in English or to which full access was obtainable could further minimise the scope of knowledge collected. In addition, the limited number of studies and lack of inter-study homogeneity further limited the extent of result comparison, necessitating further research. Despite this, the use of multiple databases and standardised quality assessment tools to analyse the quality of the studies assisted in improving the strength of the findings by ensuring a consistent and comprehensive analysis of the quality of each investigation, maximising the accuracy of conclusions drawn. 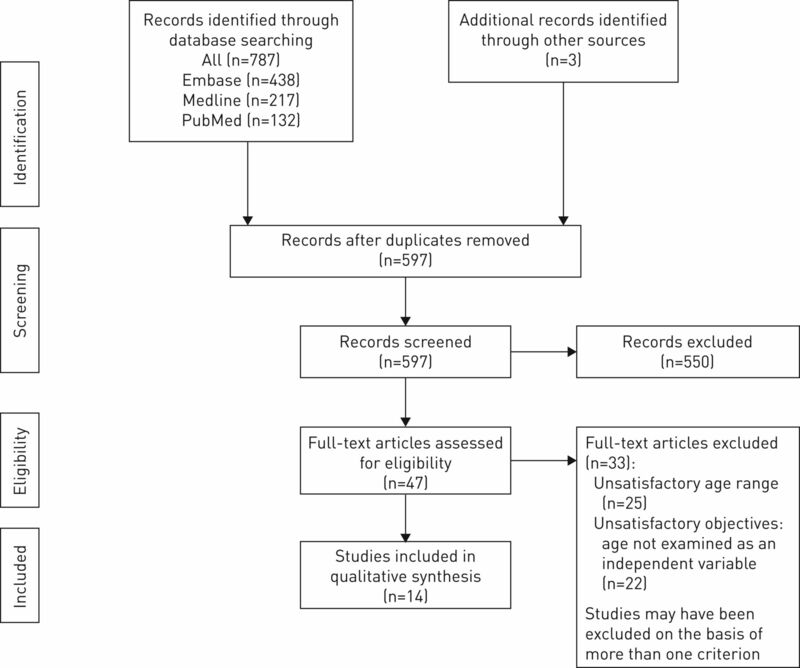 A systematic review of the literature has provided initial evidence of age-associated differences in the number and type of inhaler technique errors. Based on current findings, further study is required to explore the influence of confounders in a controlled setting. Investigations characterising the medical and socioeconomic profiles of participants and any potential confounders may further assist in defining the relationship between age and technique. We still do not understand whether it is age-, cognition-, physical ability- or device-related. There are logical reasons for us to believe that there should be an association, but a well-controlled, sufficiently powered longitudinal study characterising the population and accounting for confounders needs to be undertaken. In addition, it is unknown whether there are any variations with age regarding the ability to be trained in and retain correct inhaler technique and, if so, which factors, if any, may contribute to this. This may assist in profoundly engaging healthcare professionals and policy groups in the clinical urgency of recognising the impact of age on current inhaler technique training outcomes, driving the development of age-appropriate guidelines to be delivered sustainably across health systems. Through the delivery of such pharmacovigilance, a path towards improved clinical outcomes among the elderly can be forged. , et al. Improved asthma outcomes with a simple inhaler technique intervention by community pharmacists. J Allergy Clin Immunol 2007; 119: 1537–1538.
. Inhaler technique and asthma: feasability and acceptability of training by pharmacists. Respir Med 2011; 105: 1815–1822.
. Misuse of corticosteroid metered-dose inhaler is associated with decreased asthma stability. Eur Respir J 2002; 19: 246–251. , et al. Inhaler mishandling remains common in real life and is associated with reduced disease control. Respir Med 2011; 105: 930–938.
. Problems with inhaler use: a call for improved clinician and patient education. Respir Care 2005; 50: 1360–1375. , et al. The influence of age, diagnosis, and gender on proper use of metered-dose inhalers. Am J Respir Crit Care Med 1994; 150: 1256–1261. , et al. Acquisition and short-term retention of inhaler techniques require intact executive function in elderly subjects. Age Ageing 2003; 32: 299–302. Australian Centre for Asthma Monitoring, Woolcock Institute of Medical Research. Health Care Expenditure and the Burden of Disease due to Asthma in Australia. Canberra, Australian Institute of Health and Welfare, 2005. European Commission. Strategic Implementation Plan for the European Innovation Partnership on Active and Healthy Ageing: Steering Group Working Document. Brussels, European Union, 2011.
. Arthritis self-management: a study of the effectiveness of patient education for the elderly. Gerontologist 1984; 24: 455–457.
. Inhaler choice in primary practice. Eur Respir Rev 2005; 14: 117–122.
. Practical aspects of inhaler use in the management of chronic obstructive pulmonary disease in the primary care setting. Int J Chron Obstruct Pulmon Dis 2012; 7: 495–502.
. Inhaler device selection: special considerations in elderly patients with chronic obstructive pulmonary disease. Am J Health Syst Pharm 2011; 68: 1221–1232. Ottawa Hospital Research Institute, University of Oxford. PRISMA: Transparent Reporting of Systematic Reviews and Meta-analyses. www.prisma-statement.org Date last updated: 2015. Date last accessed: August 8, 2016. University of Wisconsin. Systematic Reviews, a Guide: Data Extraction. http://researchguides.ebling.library.wisc.edu/systematic-reviews/author/data Date last updated: 2016. Date last accessed: August 8, 2016. National Heart, Lung, and Blood Institute. Quality Assessment Tool for Observational Cohort and Cross-Sectional Studies. www.nhlbi.nih.gov/health-pro/guidelines/in-develop/cardiovascular-risk-reduction/tools/cohort Date last updated: March 2014. Date last accessed: September 18, 2016. Effective Public Health Practice Project. Quality Assessment Tool for Quantitative Studies. www.ephpp.ca/PDF/Quality%20Assessment%20Tool_2010_2.pdf Date last updated: 2009. Date last accessed: September 18, 2016.
, et al. Assessment of handling of inhaler devices in real life: an observational study in 3811 patients in primary care. J Aerosol Med 2003; 16: 249–254. , et al. Survey of the clinical use of pressurized aerosol inhalers. Can Med Assoc J 1979; 120: 813–816. , et al. Assessment of the inhalation technique in outpatients with asthma or chronic obstructive pulmonary disease using a metered-dose inhaler or dry powder device. J Asthma 1998; 35: 273–279. , et al. Predictors of incorrect inhalation technique in patients with asthma or COPD: a study using a validated videotaped scoring method. J Aerosol Med Pulm Drug Deliv 2010; 23: 323–328. , et al. Prescription bias and factors associated with improper use of inhalers. J Aerosol Med 2006; 19: 127–136.
. Dry powder inhalers: which factors determine the frequency of handling errors? Respiration 2008; 75: 18–25. , et al. Administration technique and acceptance of inhaler devices in patients with asthma or COPD. Ann Pharmacother 2015; 49: 639–648.
. Inhaler technique in the elderly. Age Ageing 1988; 17: 275–278.
. Risk factors for inadequate use of pressurized aerosol inhalers. J Clin Pharm Ther 1988; 13: 139–143. , et al. Assessment of patient performance of the HandiHaler compared with the metered dose inhaler four weeks after instruction. Respir Med 2003; 97: 1126–1133. , et al. Use and misuse of metered-dose inhalers by patients with chronic lung disease. A controlled, randomized trial of two instruction methods. Am Rev Respir Dis 1989; 140: 910–916. , et al. Inhalation technique of 166 adult asthmatics prior to and following a self-management program. J Asthma 1999; 36: 441–447.
. What determines whether an elderly patient can use a metered dose inhaler correctly? Br J Dis Chest 1986; 80: 45–49. , et al. Elderly people's technique in using dry powder inhalers. Br Med J 2001; 323: 49–50. , et al. Inhaler technique in older people in the community. Age Ageing 2004; 33: 185–188. , et al. Educational intervention for older people with asthma: a randomised controlled trial. Patient Educ Couns 2013; 93: 586–595. , et al. Characteristics predicting incorrect metered-dose inhaler technique in older subjects. Arch Intern Med 1996; 156: 984–988.
. Inhaled therapy in elderly COPD patients; time for re-evaluation? Age Ageing 2007; 36: 213–218. , et al. Inspiratory flow rates at different levels of resistance in elderly COPD patients. Eur Respir J 2008; 31: 78–83. , et al. Medical personnel's knowledge of and ability to use inhaling devices. Metered-dose inhalers, spacing chambers, and breath-actuated dry powder inhalers. Chest 1994; 105: 111–116. , et al. Measurement of peak inhalation rates with an In-Check Meter to identify an elderly patient's ability to use a Turbuhaler. Respir Med 2001; 95: 965–968. , et al. Can all patients with COPD use the correct inhalation flow with all inhalers and does training help? Respir Med 2007; 101: 2395–2401.
. Apprehension, memory, and fluid intelligence decline in adulthood. Res Aging 1981; 3: 33–84.
. Ability to learn inhaler technique in relation to cognitive scores and tests of praxis in old age. Postgrad Med J 2002; 78: 37–39.
. Competence thresholds for the use of inhalers in people with dementia. Age Ageing 1997; 26: 83–86.
. The use of dry powder inhaler devices by elderly patients suffering from chronic obstructive pulmonary disease. Ann Phys Rehabil Med 2010; 53: 69–76.